The ability of the eye to change its focus from distant to near objects; process achieved by the lens changing its shape. The lens in the eye is an elastic structure that changes shape in order to focus things near or far onto the retina. Optically, the greater the curvature of the lens, the greater its refractive power. To bring close objects into focus on the retina the lens must have a greater refractive power than in its resting state. This is accomplished via contraction of the ciliary muscles that hold the lens in place. When these muscle fibers contract, the lens, via its elasticity, springs into a more convex shape allowing a focused image of near objects. This is an energy requiring process since muscular effort is necessary, and therefore can be tiring. This front chamber of the three found in the eyeball is found between the cornea and the iris. Clear, watery fluid that flows between and nourishes the lens and the cornea; secreted by the ciliary processes. This fluid fills the anterior and posterior chambers. It is made by cells of the ciliary body and circulates from the posterior chamber, over the lens to the anterior chamber and exits via the Canal of Schlemm. It is similar to plasma but contains very little protein. A condition in which the surface of the cornea is not spherical; causes a blurred image to be received at the retina. The blending of the separate images seen by each eye into a single image; allows images to be seen with depth. (1) A small area of the retina where the optic nerve enters the eye; occurs normally in all eyes. (2) Any gap in the visual field corresponding to an area of the retina where no visual cells are present; associated with eye disease. Blood vessel that carries blood into eye; supplies nutrition to the retina. Blood vessel that carries blood from the retina. This is the vascular layer of the eye. A layer filled with blood vessels that nourishes the retina; part of the uvea. This is an expansion of the choroid at the front of the eye at the level of the lens. The lens is attached to the ciliary body, which has smooth muscle within it. Contraction of this smooth muscle changes the shape of the lens and allows the eye to focus on objects. Part of the ciliary body is specialized to make aqueous humor. The muscles that relax the zonules to enable the lens to change shape in order to focus. The extensions or projections of the ciliary body that secrete aqueous humor. One type of specialized light-sensitive cells (photoreceptors) in the retina that provide sharp central vision and color vision. Also see RODS. The thin, moist tissue (membrane) that lines the inner surfaces of the eyelids and the outer surface of the sclera. The ability to perceive differences between an object and its background. Transparent, colorless anterior making up one sixth of the covering of the eyeball. The cornea consists of 5 layers; the outer layer consisting of epithelium composed of 5-6 layers of cells that turnover every 7 days or so. This layer and the internal endothelium are responsible for keeping the cornea transparent. They do this by keeping the middle layers relatively dehydrated, which keeps the parallel collagen fibers present there from being opaque. The cornea contains no blood vessels and gets its nutrients from those in the anterior chamber fluid and surrounding vessels. A process by which the pupil is temporarily enlarged with special eye drops (mydriatic); allows the eye care specialist to better view the inside of the eye. Tiny yellow or white deposits in the retina or optic nerve head. A test to examine blood vessels in the retina, choroids and iris. A special dye is injected into a vein in the arm and pictures are taken as the dye passes through blood vessels in the eye. This specialized area of the retina is for the most acute vision. When a person is actively focusing or attending to an object the eyes are moved so that the image is focused on the fovea. It is thinner, containing only the cones necessary for detection of sharp images. The cones in this area are long and thin, resembling rods, so that they can be closely packed. Blood vessels are absent as well. Each foveal cone is directly connected to a neuron in the optic nerve. The interior lining of the eyeball, including the retina, optic disc, and macula; portion of the inner eye that can be seen during an eye examination by looking through the pupil. Farsightedness; ability to see distant objects more clearly than close objects; may be corrected with glasses or contact lenses. Pressure of the fluid inside the eye; normal IOP varies among individuals. Another expansion of the choroid that partially covers the lens formed by pigment cells, fibroblasts, blood vessels and contractile pigment cells. The pigment found in the iris prevents light from entering the eye except through the pupil. The melanocytes (pigmented cells) are responsible for the color of the eyes. If there is little pigment in the cells the light reflected from the choroid at the back of the eye will make the iris appear blue. As the amount of pigment increases the iris appears greenish-blue, gray or brown. The small almond-shaped structure that produces tears; located just above the outer corner of the eye. In the U.S., (1) visual acuity of 20/200 or worse in the better eye with corrective lenses (20/200 means that a person must be at 20 feet from an eye chart to see what a person with normal vision can see at 200 feet) or (2) visual field restricted to 20 degrees diameter or less (tunnel vision) in the better eye. NOTE: These criteria are used to determine eligibility for government disability benefits and do not necessarily indicate a person's ability to function. This biconvex structure is very elastic, at least in the young. With age the lens loses its elasticity and therefore the ability to focus on near objects decreases. The center of the lens is formed by elongated cells (fibers) that have lost all organelles and are filled with special proteins called crystallins. These fibers are replaced throughout life but the regeneration slows down with age. Mature cataracts occur when these fibers accumulate pigment granules so that they are less transparent. Visual loss that cannot be corrected with eyeglasses or contact lenses and interferes with daily living activities. The small, sensitive area of the central retina; provides vision for fine work and reading. Nearsightedness; ability to see close objects more clearly than distant objects; may be corrected with glasses or contact lenses. After the eyes are dilated, this tool provides the eye care professional with a wider view of the retina. The white, cup-like area in the center of the optic disc. The circular area (disc) where the optic nerve connects to the retina. The bundle of over one million nerve fibers that carry visual messages from the retina to the brain. The frontal, maxilla, zygomatic, sphenoid, ethmoid, lacrimal and palatine bones form this cone-shaped cavity in the skull. These bones are thin and are often subject to fractures. The eye occupies the front portion on the cavity with the rest being filled with fat, nerves, blood vessels, muscle and the lacrimal (tear) gland. This chamber occupies space between the iris and the lens. Side vision; ability to see objects and movement outside of the direct line of vision. Tool that measures the prescription for corrective lenses. The space between the back of the iris and the front face of the vitreous; filled with aqueous fluid. The gradual loss of the eye's ability to change focus (accommodation) for seeing near objects caused by the lens becoming less elastic; associated with aging; occurs in almost all people over age 45. Round opening in the iris that allows light to pass through. Pupil size changes based on the amount of light present. More light causes the pupil to contract while the pupil widens in the dark to collect as much light as possible. A test to determine the best eyeglasses or contact lenses to correct a refractive error (myopia, hyperopia, or astigmatism). This photosensitive part of the eye lies between the vitreous body and the choroid layer at the back of the eyeball and is a complex network of photosensitive cells and various types of neurons. Light that reaches the retina must travel through several layers of transparent neurons at the front of the retina before reaching the photosensitive rods and cones. The photosensitive part of rods and cones is housed in extensions of the cells that look just like their names. The rods are responsible for black and white vision while the cones detect color. The neurons within the retina act to integrate the visual signals received by the rods and cones and transfer the information to the optic nerve. This layer lying between the retina and choroid, contains melanocytes that make for its characteristic black color. This pigment layer nourishes the retinal cells and allows the inside of the eye to absorb stray rays of light like the black paint inside a camera or within a dark room. One type of specialized light-sensitive cells (photoreceptors) in the retina that provide side vision and the ability to see objects in dim light (night vision). This canal drains fluid from the anterior chamber. Obstruction of this canal leads to an increased intraocular pressure, which can damage the retina. This condition is also called glaucoma. A slit lamp, with its high magnification, allows the eye care professional to examine the front of the eye. The tough, white, outer layer (coat) of the eyeball; along with the cornea, it protects the entire eyeball. A tool that measures pressure inside the eye and is one of several tests necessary to detect glaucoma. The standard to determine the fluid pressure inside the eye (intraocular pressure). The spongy, mesh-like tissue near the front of the eye that allows the aqueous fluid (humor) to flow to Schlemm's canal and then out of the eye through ocular veins. The middle coat of the eyeball, consisting of the choroid in the back of the eye and the ciliary body and iris in the front of the eye. The ability to distinguish details and shapes of objects; also called central vision. The entire area that can be seen when the eye is forward, including peripheral vision. The transparent, colorless mass of gel that lies behind lens and in front of retina. The chamber that occupies the space behind the lens to the retina. It is filled with a gelatinous substance called the vitreous body. The fibers that keep the lens suspended in position and enable it to change shape during accommodation. 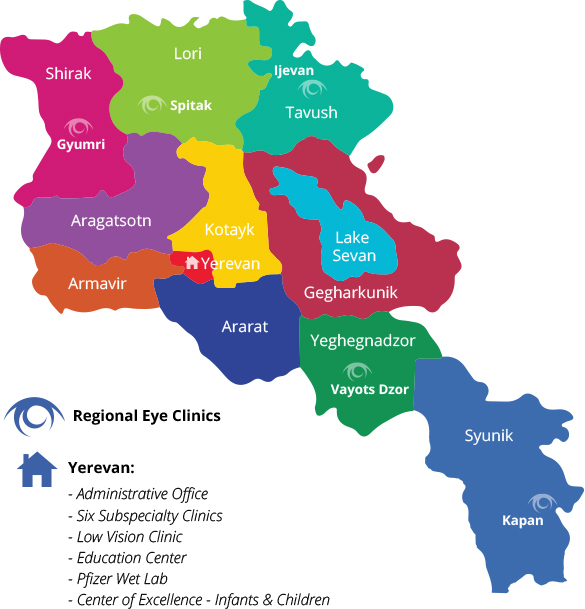 Copyright © 2019 The Armenian EyeCare Project. All Rights Reserved.